Nyssa fans, assume brace positions: base-under-siege Alien Heart is prologue to a gut-punch of a payoff in Dalek Soul. This month and the next two Main Ranges are double features. While the second story in this month’s release is far more powerful and original than the first, you can’t simply skip to Dalek Soul, because events in Alien Heart have repercussions that are picked up by its sequel. Remember how Logopolis built upon unfinished business (the Master’s new body, the introduction of Nyssa) from Keeper of Traken. Alien Heart is an adventure/thriller ringing changes on a fairly standard Who plot: the Doctor and companion land just in time to be suspected of causing attacks by an unknown menace, and they have to convince the locals they’re not the culprits and thwart the diabolical plot of the real enemy. The Doctor and Nyssa both follow this formula, even though they’re separated practically from scene one. The Doctor falls in with a couple of Earth Empire agents investigating attacks just outside Empire space, while Nyssa gets dragged off to a nearby planet where a miner is equally suspicious of her. Nyssa’s not as good at this sort of thing as the Doctor, but they both navigate perils, twists and turns with their usual blend of technical skills, wits, morality and courage. There’s some grisly and scary scenes when the monsters come out, and a few clever twists to keep the villains from being absolutely predictable. All in all, Alien Heart is a satisfying but not particularly innovative corridor crawl, a typical Day at the Office for Five and Nyssa, for whom alien menaces and saving planets from imminent destruction are all in a day’s work. Which is all necessary prologue to set up an emotionally intense character drama, Dalek Soul. After we’ve had a refresher course on what Nyssa and the Fifth Doctor are like on an ordinary day (for them), Guy Adams snatches the rug out from under them, and from us. This is a take on the Fifth Doctor and Nyssa that we’ve never seen before, which is saying something after 3 years of TV and 17 years of audio adventures, not to mention Goth Opera. Peter Davison and Sarah Sutton rise magnificently to the occasion. You’ll probably want to listen to it twice, because part of the fun is being unnerved by incidents that are beyond the usual scope of Doctor Who, keeping the listener off-balance as we try to piece together what’s going on. But everything makes sense by the end. Once again, I’m having to be vague to avoid spoilers. I don’t even want to post a link to the trailer on the Big Finish website, as it gives away a tad too much. Yes, there are Daleks, and Nick Briggs is up to his usual standards in making pepperpot overlords sound genuinely scary. Yes, Nyssa and the Doctor are at loggerheads in this one, each of them helping a different faction on a Dalek-occupied world. There’s an extremely pared-down cast of extras, all subordinate to the Daleks’ diabolical plan and an uncharacteristically strained relationship between the Doctor and Nyssa. In a way, Dalek Soul digs down to the roots of this TARDIS team in a way that Big Finish hasn’t done since Circular Time. But if that was a touching fairy tale about a deep and abiding friendship, this… is a nightmare. Dalek Soul may not be quite as moving and powerful for listeners who are not especially fans of this TARDIS team. Even so, I think it’s a standout story for Big Finish, certainly the best these two characters have had in years. It reminds me a little of both Dalek Empire and Heaven Sent, in that it’s a crucible pushing characters we know to their absolute limits, telling a story that tests the boundaries of what kinds of stories Doctor Who can tell. Hoo boy. I had so many things to say about these audios, especially Dalek Soul, that I kept deleting sentences so as not to give surprises away. Let me see if I can remember some of those thoughts. First of all: the trailer gave away a little too much about Nyssa, but it brilliantly avoids telling us anything much about the Doctor in the second story. 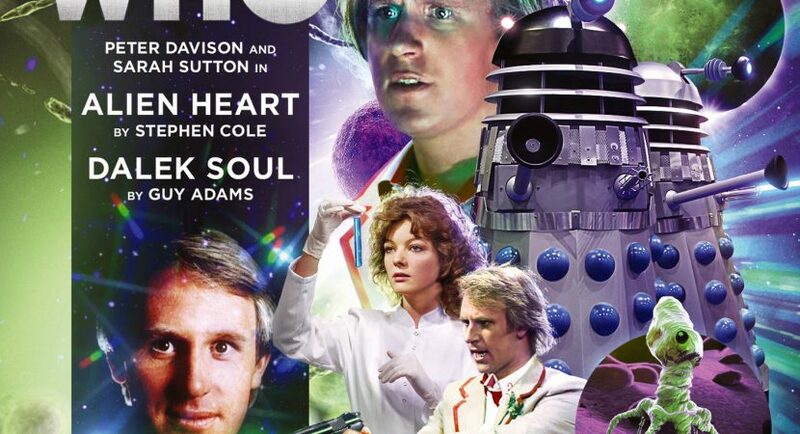 Between that and the cover art, I was misled into thinking Nyssa would turn out to be the “Alien Heart / Dalek Soul” of the title. She is, to some extent, but the Doctor is even moreso. (I’ve always liked the fact that they’re both aliens, with outsider perspectives on humanity, as the intro to Alien Heart reminds us). From the trailer and cover art, I guessed that Nyssa was going to turn out to be brainwashed, a clone, or have to compromise her ethics to stay alive (like Susan Mendes, or like Nyssa did in Rat Trap, which I think was a betrayal of the character). I’m so glad that Guy Adams dodged Rat Trap character distortion and went with options one and two. It was a tricky bit of dramatisation: we could’ve felt cheated at the end when it turned out the real Doctor and Nyssa almost don’t come into the story. But Dalek Soul rather cleverly explores the bond between the real Doctor and Nyssa by breaking it, illuminating it via negative space. Their friendship normally hinges on all they have in common: their intelligence, their compassion, their strong sense of ethics, and the love and respect they have for one another. Here, all of that breaks down, and the result is viscerally disturbing. Fantastic. The real Doctor, the hero, is present in the climax despite his absence, inspiring evil!Nyssa to redeem herself (partly) by trying to emulate him. Her final words, “At least this is one planet he doesn’t have to…[save]” and “I wish I could have met him” made my eyes water. Meanwhile, Evil!Doctor can’t hold a candle to the real Doctor, although it’s great fun hearing Pete cut loose and try his hand at playing nasty again. Sarah is absolutely astonishing in this, managing to convey an evil character who is still sympathetic, tweaking the character she usually plays ever so subtly (unlike the real one, this Nyssa is not fooled when people try to deceive her with white lies, but she pretends to be). Second of all: In the CD extras, Nick Briggs explains that these double-feature Main Range experiments are inspired by the fact that modern storytelling techniques allow for faster-paced, more compressed stories that boil down what used to take four episodes into two. He laments that four-parters often suffer from too much running-down-corridors padding. Granted. We all know the kind of stories he’s talking about. BUT. (You knew there was a but.) Despite the fact that Alien Heart is a two-parter, it’s guilty of exactly that problem. It’s fine, don’t get me wrong: good classic Who entertainment. But the majority of the story is just characters running up and down corridors or tunnels doing stuff: fiddling with consoles and gadgets, analysing signals and data, and dodging baddies. The Doctor and Nyssa are separated for almost the entire story, so there’s never much time to catch up with them as characters, only as chesspieces on a board. Dalek Soul, by contrast, hinges almost entirely on character-driven conversations and revelations. Ironically, despite the fact that they aren’t the real Nyssa or Doctor, they share more in-depth character interactions than the Fifth Doctor and his companions have done for most of his recent outings stretching all the way back to the Turlough, Tegan and older!Nyssa adventures. Dalek Soul answers the critique I’ve raised in many recent reviews: separating the Doctor and companions for the bulk of an audio allows them to do more, but it shortchanges the Doctor-companion dynamic. We can go to new Who for plot. But we can’t go to new Who to reconnect with and rediscover classic TARDIS teams we’ve known for years. I so desperately want to hear more of TARDIS teams working together as a team. Long after we’ve forgotten the details of a plot, fans relate to and enjoy the relationships the Doctor has with his companions. There doesn’t have to be a romantic component for those relationships to be meaningful (although there can be). Depending on the era, Classic Who sometimes portrayed surprisingly nuanced character dynamics between the regulars, from the antagonists-to-fast-friends arc of Ian, Barbara and the First Doctor, to the First Doctor adopting various surrogate granddaughters, to Two’s lovely family unit, to Three’s exasperation with his UNIT cohort, to the mentor-student relationship between Ace and Seven. You can probably remember many more interesting Doctor-companion configurations. Rather than padding out four-part stories with corridor crawls and lots of “What’s that, Doctor!” “Duck!” that don’t hold one’s interest for too many re-listens, I think the best Big Finish audios have folded in more nuanced, modern character development with traditional long-plotted serials. Think of Five and Nyssa’s shouting match over Adric and the Cybermen in Spare Parts. Or the better Eight and Charley stories. Or the slow and not-entirely-healthy evolution of Ace and Seven from teenager with cool professor to covert operative and pawn for a machiavellian chessmaster. Think of the evolution of Six and Evelyn’s friendship, or BFFs Peri and Erimem, or Jago & Litefoot, or Susan Mendes, Kalendorf and Alby. The EU characters have had more complex character evolutions than classic TV companions, because BF feels freer to embellish them. But let’s face it: Big Finish has preserved classic Who companions for decades longer than most of their TV runs, picking them up after the original show thought there was nothing else to be done with them. If BF wants to shake up the four-parter format and keep things fresh, it could do worse than to look to their stronger character-driven stories like Arrangements for War, Spare Parts, Peri and the Piscon Paradox and Chimes of Midnight, and dare to innovate more with classic Who characters. Dalek Soul does exactly that. So, too, did Fiesta of the Damned, at least for Mel. Based on these two samples, I look forward very much to the next Guy Adams script.